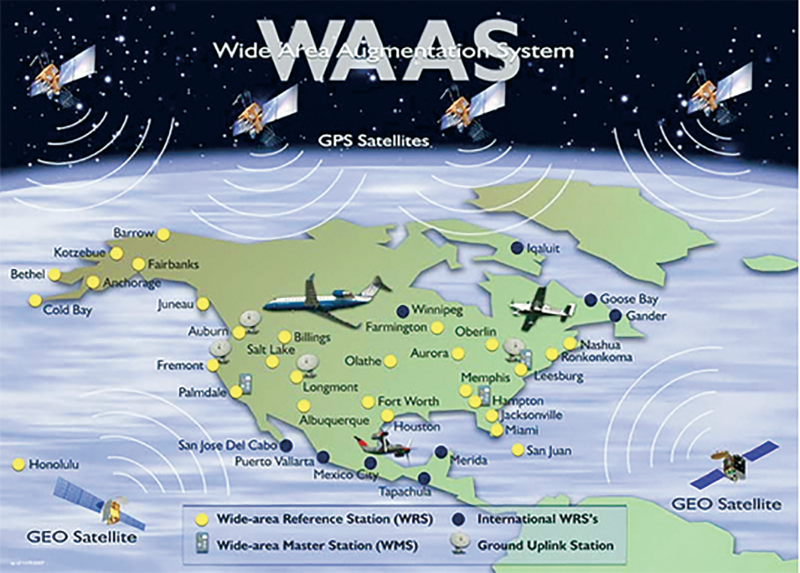 Global satellite provider, SES Government Solutions (SES GS), will support the Federal Aviation Administration’s (FAA) Wide Area Augmentation System (WAAS) on the ground as well as in space. Raytheon Integrated Defense Systems has announced the company’s selection of SES GS to build two GEO Uplink Subsystem stations to support the next generation of the WAAS network. The data transmitted by the uplink stations will improve the accuracy, integrity and availability of the GPS signals intended to enable aircraft to rely on GPS for all phases of flight, including precision approaches to airports within the coverage area. “Since the closing of Ex-Im Bank, the United States has had at least three pre-existing commercial satellite orders withdrawn, lost other awards, and been barred from other competitions entirely. “This is just the tip of the iceberg. In the highly competitive commercial satellite manufacturing market, support from export credit agencies (ECAs) can be the difference between the winning proposal and a competitive one. And, in some cases, ECA support is a required component of the proposal. “The longer the Ex-Im Bank remains closed, the greater the damage will be to U.S. satellite manufacturers and the hundreds of local businesses that supply them. “American manufacturers have been the leaders in the global commercial satellite manufacturing market, winning 57 percent of orders placed in 2014. Congress risks allowing this competitive edge to slip by failing to ensure a level playing field for American-made satellites. “Access to financing is a crucial element in winning satellite business – given that most commercial satellites cost hundreds of millions of dollars, raising the funds to order spacecraft is time-intensive, complicated, and can make or break a business plan. “Foreign ECAs, recognizing the growing importance of the sector, have been aggressive in offering competing export credit deals for new satellite operators. SIA is a U.S.-based trade association providing worldwide representation of the leading satellite operators, service providers, manufacturers, launch services providers, and ground equipment suppliers. 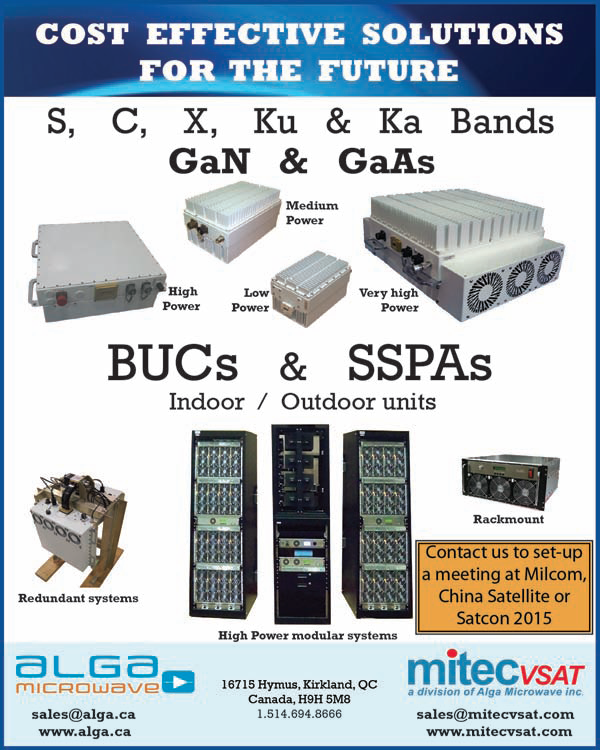 Advantech Wireless announces the release of their Second Generation Gallium Nitride (GaN) Technology based 50 Watt X-Band Solid State Power Block/Block Up Converter (SSPB/BUC) for Tactical Mobile Military Applications. 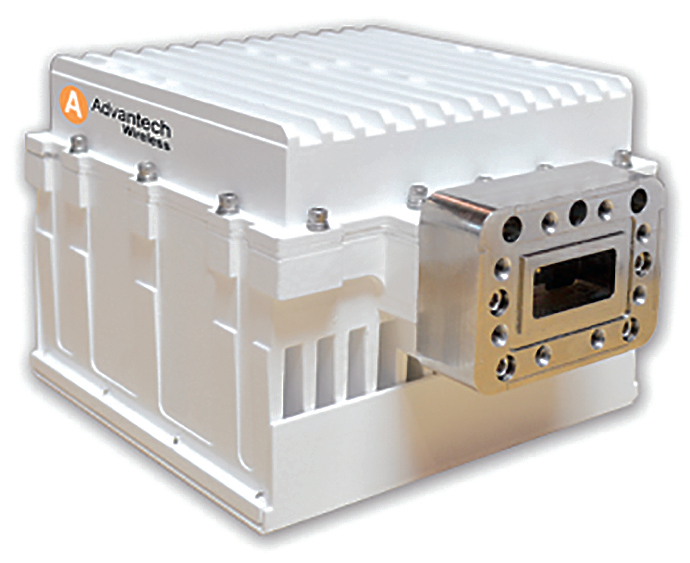 The Second Generation GaN based 50W X-band SSPBs from Advantech Wireless are weatherproof and constructed in a compact cooling enclosure for outdoor operation. These BUCs feature exceptional linearity and operating efficiency and are the smallest fully integrated units on the market today. With built-in design features and less than 3.5 kg, they are perfectly suited for harsh environments, SATCOM-On-The-Move (SOTM) and manpack terminal deployments. The design of the Second Generation 50W GaN X-band BUCs is based on Advantech Wireless’s industry proven reliable solid-state high power amplifiers. With protection against thermal runaway and out-of-lock conditions, the units are completed with power supply, phase-locked oscillator, mixer, filter and cooling mechanism providing the utmost in performance, convenience and efficiency. “The Second Generation 50W X-band GaN product line continues on the development road map started by the 25W X-band GaN launched in 2012. With several hundred 25W units already successfully deployed in the field, the new 50W BUC will allow higher output power, and higher data rates for mission critical, bandwidth hungry operations in challenging mobile military environment. “These units are designed for extreme low weigh SOTM, man packs, and flyaway applications, where weight and energy efficiency is the driving factor,” said Cristi Damian, VP Business Development at Advantech Wireless. 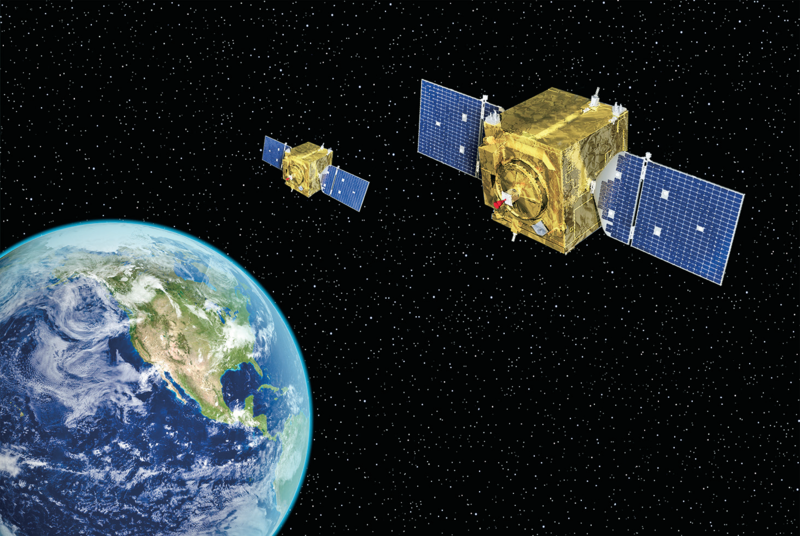 The Air Force has published a final Request for Proposal (RFP) for Global Positioning System (GPS) III Launch Services, September 30. Launch services include launch vehicle production, mission integration and launch operations for a GPS III mission scheduled to launch in 2018. 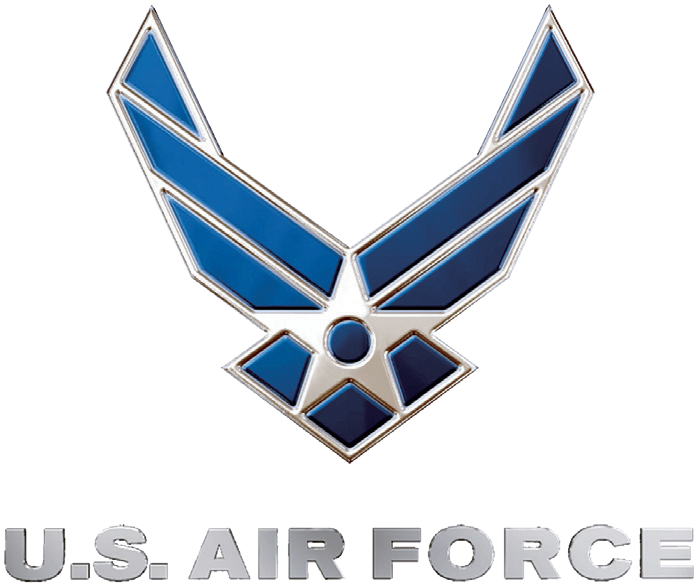 Proposals are due back to the Air Force no later than November 16, in accordance with the solicitation instructions. After evaluating proposals through a competitive, best-value source selection process, the Air Force will award a firm-fixed price contract that will provide the government with a total launch solution for the GPS III satellite. The Air Force’s acquisition strategy for this solicitation achieves a balance between mission success, meeting operational needs, lowering launch costs, and reintroducing competition for National Security Space missions. 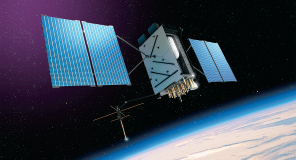 Artistic rendition of a GPS III satellite. Image courtesy of Lockheed Martin. GPS III is expected to provide improved anti-jamming capabilities as well as improved accuracy for precision navigation and timing. GPS III will incorporate the common L1C signal which is compatible with the European Space Agency’s Galileo global navigation satellite system and compliment current services with the addition of new civil and military signals. The Phase 1A procurement strategy reintroduces competition for national security space launch services. Under the previous Phase 1 strategy, United Launch Alliance (ULA) was the only certified launch provider. 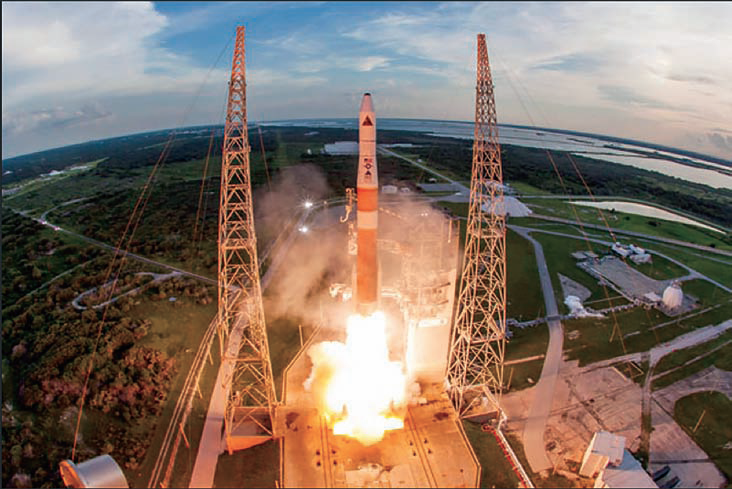 In 2013, ULA was awarded a sole-source contract for launch services as part of an Air Force “block buy” of 36 rocket cores that resulted in significant savings for the government through FY 2017. 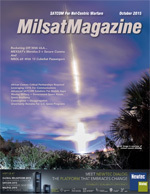 “Through this competitive solicitation for GPS III launch services, we hope to reintroduce competition in order to promote innovation and reduce cost to the taxpayer while maintaining our steadfast laser focus on mission assurance and assured access to space,” said Lt. Gen. Samuel Greaves, Space and Missile Systems Center commander and Air Force Program Executive Officer for Space. First Two GSSAP’s Are Declared Operational By U.S.A.F. 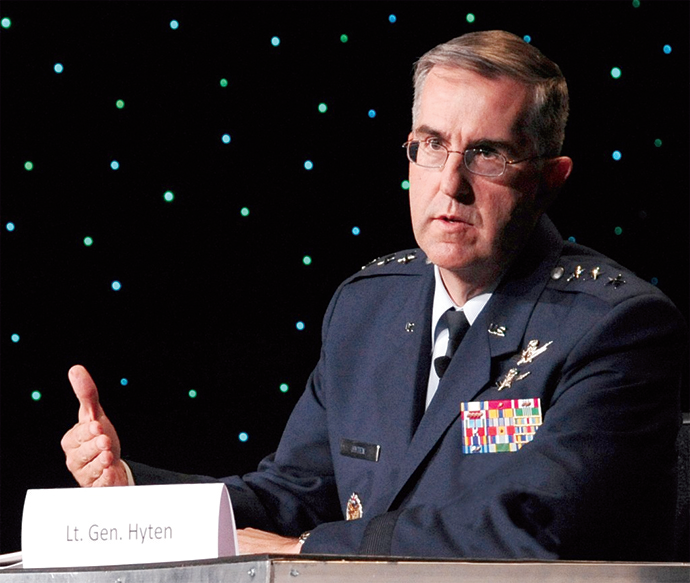 General John E. Hyten, commander of Air Force Space Command (AFSPC), declared Initial Operational Capability (IOC) for the first two Geosynchronous Space Situational Awareness Program (GSSAP) spacecraft on September 29, 2015. This significant achievement is reflective of the outstanding collaboration between numerous organizations, including AFSPC, U.S. Strategic Command (USSTRATCOM) and its Joint Functional Component Command for Space (JFCC Space), the Space and Missile Systems Center, 14th Air Force, the 50th Space Wing (50th SW) and Orbital ATK Corporation. This is the latest in a series of efforts by the defense and intelligence communities to strengthen Space Situational Awareness (SSA), including establishing a new Joint Interagency Combined Space Operations Center, agreeing to continue working together to increase space collaboration and coordination, and taking other steps to increase resilience. The declaration of IOC for GSSAP concludes successful testing of the system and brings on line an SSA capability that will improve our ability to rapidly detect, warn, characterize and attribute disturbances to space systems in the geosynchronous (GEO) environment. The system reduces the likelihood of space collision, increases safety in this domain and will support USSTRATCOM’s Unified Command Plan-assigned mission to plan and conduct SSA. The Automated Navigation and Guidance Experiment for Local Space satellite, an Air Force Research Laboratory experimental satellite, and two Air Force Space Command Geosynchronous Space Situational Awareness Program, or GSSAP, satellites launch July 28, 2014, from Cape Canaveral Air Force Station, Fla. The ANGELS program is managed by the AFRL’s Space Vehicles Directorate, located at Kirtland Air Force Base, New Mexico. The 45th Space Wing provided launch support for the United Launch Alliance Delta IV vehicle, including weather forecasts, launch and range operations, security, safety, and public affairs. Photo is courtesy of United Launch Alliance. The Space and Missile Systems Center, located at Los Angeles Air Force Base, operated the satellites during nearly a year of developmental testing. 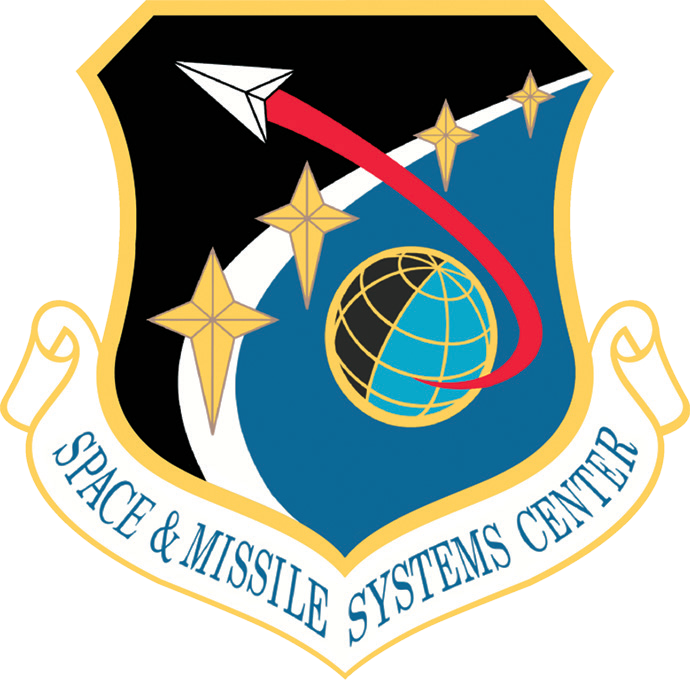 At the conclusion of testing, the Space and Missile Systems Center turned operational control of the satellites over to 14th Air Force, which was delegated to the 1st Space Operations Squadron, 50th Space Wing, for operational test and evaluation. GSSAP satellites are a space-based capability operating in the near-geosynchronous orbit regime, supporting U.S. Strategic Command space surveillance operations as a dedicated Space Surveillance Network (SSN) sensor. GSSAP satellites are tasked to collect space situational awareness data that allows for more accurate tracking and characterization of man­-made orbiting objects. From a near-geosynchronous orbit, GSSAP will have a clear, unobstructed and distinct vantage point for viewing Resident Space Objects (RSOs) without the interruption of weather or the atmospheric distortion that can limit ground-based systems. GSSAP satellites will operate near the geosynchronous belt and will have the capability to perform Rendezvous and Proximity Operations (RPO). RPO allows for the space vehicle to maneuver near a resident space object of interest, enabling characterization for anomaly resolution and enhanced surveillance, while maintaining flight safety. GSSAP satellites will communicate information through the world-wide Air Force Satellite Control Network (AFSCN) ground stations, then to Schriever Air Force Base, Colorado, where 50th Space Wing satellite operators of the 1st Space Operations Squadron (1 SOPS) will oversee day-to-day operations. Inmarsat has demonstrated the company’s ongoing commitment to support government communications needs worldwide by providing essential capability for both real-time crisis as well as emergency response preparedness and training in the recent Pacific Endeavor exercise. 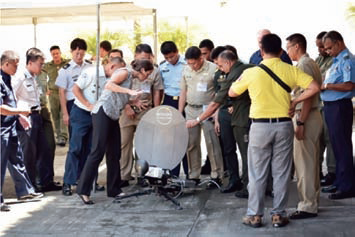 U.S. Marine Corps Major Erika Teichert, from the Naval Post Graduate School, instructs communicators from the Asia-Pacific region on the setup of a mobile satellite system in Makati City, Manila, Philippines, on September 10, 2015. U.S. Pacific Command, photo by TSgt Todd Kabalan. The event was co-hosted by U.S. Pacific Command (USPACOM) and the Armed Forces of The Philippines (AFP) J6 and took place in Manila, Philippine. Military representatives from 21 Pacific nations also took part in SatCom Endeavor, a part of Exercise Pacific Capstone event, to jointly train and learn about the latest satellite communications capabilities. This type of exercise is critical to the success and preparation for the next humanitarian aid disaster response (HA/DR) situation. As part of this training, Inmarsat executives provided an overview of the company’s Broadband Global Area Network (BGAN) and Global Satellite Phone Service (GSPS). These services deliver a valuable ‘First In’ SATCOM capability, to first responders entering a disaster area based on its voice quality, small size, global coverage and ease of use. Major Leo Caduyac, a Philippine Army Signal Command Soldier check radio communications during Exercise Pacific Endeavor 2015. Sponsored by U.S. Pacific Command and hosted by the Armed Forces of the Philippines, Pacific Endeavor is a multinational workshop designed to enhance communication interoperability and expedite Humanitarian Assistance and Disaster Relief response in the Asia-Pacific. The workshop will be held until September 11, 2015, and will involve 21 allied and partner nations. Inmarsat’s portfolio of reliable, managed satellite communications services help overcome the hazards of both natural and man-made catastrophes. The company offers both voice and data access so responders can assess damage, rescue victims and call for support. 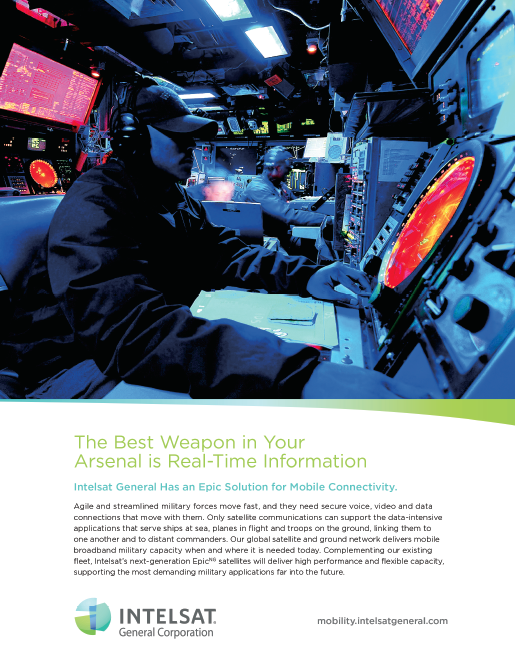 They acquire instant phone, broadband and wideband services in critically-hit areas – regions where other communications options have failed—using equipment that is as easy to use as a standard cell phone, and often small and light enough to store in a backpack. When a disaster strikes, many times the location’s basic infrastructure is destroyed. The cell towers, the Internet providers and the backbone of communication infrastructure are gone. Setting up communication quickly after a disaster is vital to saving lives. Hands on training with mobile broadband equipment give these partners a chance to practice and work out any issues. “The BGAN gives five or six people that first-in capability to tell their higher headquarters what the ground truth is, so that that higher headquarters can plan and ensure that the right help is going to the right people, at the right time, and the right place,” said Major Erika Teichert, a Marine Corps officer from the Naval Post Graduate School. Strengthening relationships and interoperability is the main focus of exercise Pacific Endeavor 2015. SatCom Endeavor in particular, provided the partner nations the ability to build strong relationships in addition to strong networks. These relationships will be vital when the next HADR crisis comes. Exercise Pacific Endeavor 2015 is comprised of multiple training modules aimed to keep participants ahead of cyber, satellite, and radio technological advances, in case of a disaster. Representatives from the Multinational Communications Interoperability Program (MCIP) are co-hosting the exercise with the Armed Forces of the Philippines (AFP) to help improve interoperability of communications technologies between partner-nations in the pacific region. Defense Media Activity – Hawaii News Bureau, U.S. Air Force. The U.S. Naval Research Laboratory (NRL), in collaboration with numerous universities and government laboratories studying the effects of dusty plasmas—charged dust particles that can occur naturally in the mesosphere—generated an artificial plasma cloud in the upper-atmosphere to validate the theory of ‘dressed particle scattering’ caused by this phenomenon. Launch of the Charged Aerosol Release Experiment (CARE II) from Andoya Space Center in Norway, September 16, at 19:06 GMT. Debris of polystyrene thermal cover of payloads rains particles on the launch pad. The rocket carried the radio beacon, chemical release, and instrument payloads to an apogee of 280 kilometers (km) for a dust release on the down leg at 266 km altitude. Photo is courtesy of NASA/Wallops Flight Facility. 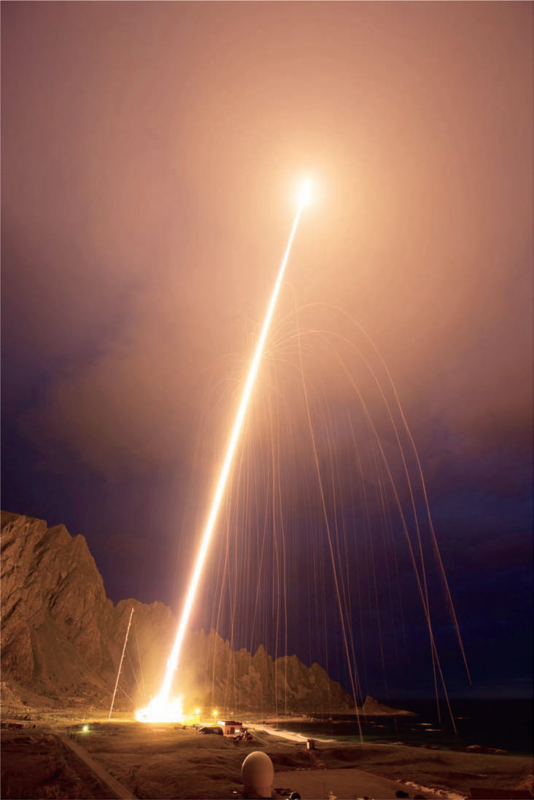 Named the Charged Aerosol Release Experiment (CARE II), an instrumented rocket was launched September 16, at 19:06 GMT, from Andoya, Norway, using a NASA Black Brant XI sounding rocket. After entering the ionosphere, 37 small rockets were fired simultaneously to inject 68 kilograms (kg) of dust comprised of aluminum oxide particulates, accompanied by 133 kg of molecules such as carbon dioxide, water vapor, and hydrogen. The launch occurred just after sunset placing the dust particles in sunlight for easy viewing by cameras in darkness on the ground and with an airborne platform. The large concentration of dust and exhaust material interacted with the ionosphere to produce a so-called ‘dirty plasma’ with high-speed pickup ions. Visibly seen from the ground, the released dust produces an optical cloud, and, by attaching the electrons in the ionosphere, forms charged particulates. This plasma then generates waves that scatter radar signals used for remote sensing. The NRL Plasma Physics Division’s (PPD) Charged Particle Physics Branch and the University of Washington made measurements with plasma probes and electric field booms on a deployable instrument payload. Ionospheric disturbances were monitored with multi-frequency beacon transmissions from the rocket payload that were detected by a network of ground receivers from the Finnish Meteorological Institute (FMI), Sodankylä Geophysical Observatory (SGO), and NRL PPD. The Black Brant XII rocket stands 65 feet tall and produces about 70,000 pounds of thrust at lift off. The fourth stage does not require fins since it is ignited outside the atmosphere. The 5 Hertz spin rate keeps the rocket stabilized, much like a gyroscope. Image courtesy of NASA. Ground radars and optical instruments that recorded the dust release were provided by the European Incoherent Scatter Scientific Association (EISCAT); Institute of Applied Physics (Germany); Institute of Space Physics, (Sweden); and others. The Black Brant XII rocket stands 65 feet tall and produces about 70,000 pounds of thrust at lift off. The fourth stage does not require fins since it is ignited outside the atmosphere. The 5 Hertz spin rate keeps the rocket stabilized, much like a gyroscope. The CARE theory effort was based in PPD and the Laboratory for Computational Physics and Fluid Dynamics (LCPFD) at NRL, as well as the Center for Space Science and Engineering Research at Virginia Tech. High frequency receivers were fielded by QinetiQ (UK) and by NRL PPD with stations in Oslo, Tromsö, and the University Center in Svalbard (UNIS). The Department of Defense (DoD) Space Test Program sponsored the launch and payload integration for the NRL CARE II mission. 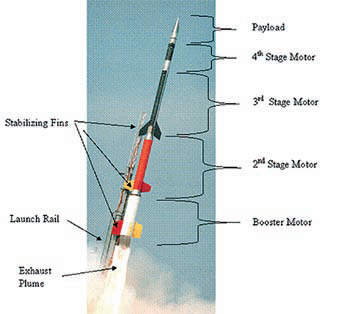 The rocket launch, and payload development was provided by the NASA Sounding Rocket Program. The CARE experiments were designed to test the theory of dusty plasma scatter developed by scientists at the University of Tromsö in Norway and NRL PPD.